Choosing a Heil® furnace means more than just selecting a brand. It means selecting a product backed with tremendous assets in design engineering, quality manufacturing, and service support—as well as a 100-year tradition of excellence. We’re dedicated to bringing you home comfort products that meet and exceed your expectations for high quality, energy efficiency, and reliability. You can depend on us. Direct, hot-surface ignition system features an advanced silicon nitride igniter and in-shot burners for greater reliability. Temperature limit control, reliable gas valve, and induced draft motor all help ensure safe operation. 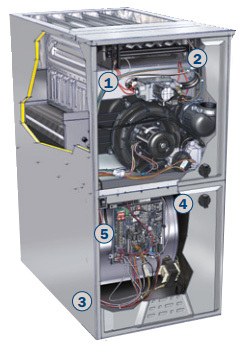 Solid pre-painted steel insulated cabinet with tightfit door latch system; blower motor isolated behind a sealed door; and soft-mount rubber gaskets on key components lower operating sounds. ECM variable-speed blower motor provides efficiency. The VT 96 is also compatible with twostage cooling, and its advanced dehumidification capability can reduce additional moisture in the air when paired with an air conditioner or heat pump and a humidity-sensing thermostat. ControlState-of-the-art electronic controls monitor system operation and allow for faster, easier system diagnostics.